The liger is a hybrid cross between a male lion (Panthera leo) and a female tiger (Panthera tigris). 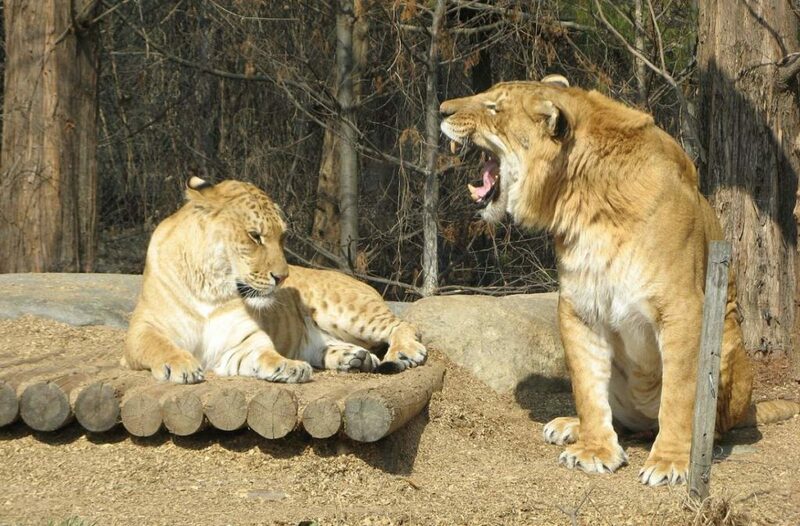 Ligers (and tigons) exist only in captivity because the habitats of the parental species do not overlap in the wild. Historically, when the Asiatic Lion was prolific, the territories of lions and tigers did overlap and there are legends of ligers existing in the wild. The liger is often believed to represent the largest known cat in the world. A liger looks like a giant lion with muted stripes but like thier tiger ancestors. Breeding of two different pantheras has been banned in many zoos and animal sanctuaries due to no conservation value of the hybrid, and the risk it poses on the mother that gives birth to it. For instance, the liger’s increased growth rate and enormous size can cause the tigress giving birth to have a difficult delivery, endangering both the mother and her liger cubs, which may be born prematurely or require a Caesarian. Common problems in cubs that survive are neurological disorders, obesity, genetic defects, and a shortened lifespan; though a few have reportedly made it to their twenties, many don’t survive past the age of seven. Moreover, male ligers have lowered testosterone levels and sperm counts, rendering them infertile while females, though capable of reproducing with either a lion or a tiger, often give birth to sickly cubs that don’t survive. Four of the five species of the big cats (the Panthera genus – lion, tiger, leopard, jaguar and snow leopard), the exception being the snow leopard can hybridize with each other to produce numerous hybrids. In fact, breeding of two different pantheras to produce hybrid big cats has been banned in many zoos and animal sanctuaries due to no conservation value of the hybrid, and the risk it poses on the mother that gives birth to it. For instance, the liger’s increased growth rate and enormous size can cause the tigress giving birth to have a difficult delivery, endangering both the mother and her liger cubs, which may be born prematurely or require a Caesarian. Common problems in cubs that survive are neurological disorders, obesity, genetic defects, and a shortened lifespan; though a few have reportedly made it to their twenties, many don’t survive past the age of seven. Moreover, male ligers have lowered testosterone levels and sperm counts, rendering them infertile while females, though capable of reproducing with either a lion or a tiger, often give birth to sickly cubs that don’t survive. However, hybrids do occur by accident in captivity. Most hybrids would not survive in the wild due to the males being infertile, but a few (such as the Leopon – leopard father, lion mother) are fertile and have a chance of survival in the wild. Ligers are the largest cats on Earth. A liger can be more than 900 pounds (~408 kg) in weight and 12 feet (~3.65 m) long, weighing almost 100 times more than house cats and almost twice as much as either Panthera tigris (tiger) or Panthera leo (lion).